Understanding the taxability also involves knowing whether item is exempt or not under GST. Due to the scope of taxable supplies being widened under GST, GST Exemptions have clearly been defined. Not just knowing the Exemption list, but also understanding the implication of item being exempt is important as certain conditions are attached to it like reversing the ITC. Also, what can be Nil rated today may become charged to a higher tax rate in the future. Hence, clearly demarking the various terms such as Nil Rated, Exempt, Zero-rated and Non-GST supplies under GST is important. Read through and get the complete list of all the GST Exemptions notified on services in a click of a button! What is a non-taxable supply? 1. What is Exempt Supply? Non-taxable supplies as defined under Section 2(78) – supplies that are not taxable under the Act (For Example Alcoholic liquor for human consumption. Tax need not be paid on these supplies. Input tax credit attributable to exempt supplies will not be available for utilization/setoff. Absolute exemption or conditional exemption may be for any services and / or services of any specified description. Exemption by way of special order (not notification) may be granted exceptional circumstances. Registered person supplying the services and / or services is not entitled to collect tax higher than the effective rate, where the supply enjoys an absolute exemption. Supplier may be exempt – Exemption to the person making supplies-i.e supplier, regardless of the nature of outward supply. Ex: Services by Securities and Exchange Board of India, Services by Charitable entities. Certain Supplies may be exempt –Certain supplies due to their nature and type are exempted from GST. All supplies that are notified would be eligible for the exemption. Here, irrespective of who the the supplier is, exemption is allowed. not very much relevant. Absolute exemption: Exemption without any conditions. Ex: Transmission or distribution of electricity by an electricity transmission or distribution utility, Services by Reserve Bank of India. Conditional Exemption: Exemption subject to certain conditions. Ex: Services by a hotel, inn, guest house, club or campsite, by whatever name called, for residential or lodging purposes, having declared tariff of a unit of accommodation less than ` 1000/- per day”. Intra-State supplies of services and/or services received from an unregistered person by a registered person is exempted from payment of tax under reverse charge provided the aggregate value of such supplies received by a registered person from all or any of the suppliers does not exceed ` 5000/- in a day. Note that the exemption allowed under the CGST Act cannot be deemed to be applicable under IGST Act. In other words, GST Exemption allowed in case of inter-State transactions is not the same as the GST exemptions available in case of Intra-State transactions. In case of exempt supplies, amount of credit as attributable to exempt supplies shall be reversed. How to determine the credit attributable to exempt supplies in the above case? Less: Ineligible credits as per Section 17(5) Works contract, Rent a cab etc. 3. What is a non-taxable supply? 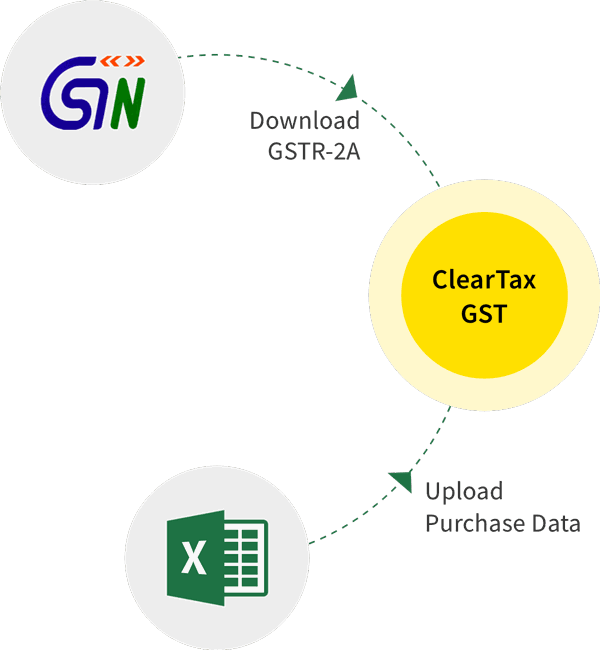 “non-taxable supply” means a supply of goods or services or both which is not leviable to tax under CGST Act or under the IGST Act. A transaction must be a ‘supply’ as defined under the GST law to qualify as a non-taxable supply under the GST. Note: Only those supplies that are excluded from the scope of taxation under GST are covered by this definition – i.e., alcoholic liquor for human consumption, articles listed in section 9(2) or in schedule III. It must also be noted that the following items are not out of scope of GST. That means GST Rate has not yet been announced or notified for them. Functions performed by the MPs, MLAs etc. Duties performed by any person who holds any post in pursuance of the provisions of the Constitution in that capacity. Supplies made to SEZ or SEZ Developers. Nil Rated Supplies that have a declared rate of 0% GST. Example: Salt, grains, jaggery etc. Exempt Supplies are taxable but do not attract GST and for which ITC cannot be claimed. Example: Fresh milk, Fresh fruits, Curd, Bread etc. Non-GST These supplies do not come under the purview of GST law. Example: Alcohol for human consumption, Petrol etc. Who has the powers to grant exemption from payment of taxes? Only Government has the power to grant exemption. On the recommendations of the GST Council, the Government by notification may grant exemption from tax. From which date does exemption apply? Date of notification or date of publication of notification? Exemption notifications will apply from the effective date as specified in the notification. I am a trader dealing with dealing with only tax-exempt supplies. Is it necessary to register under GST, if the turnover exceeds Rs.20 lakh? There is no requirement of registration under GST if a person is dealing with 100 per cent exempt supplies. Is supply of exempt services considered taxable or non-taxable supply? Supply of exempt services is considered non-taxable. Hence, such supplies do not trigger Registration, claim for input tax credit and other relevant provisions. Should I issue a tax invoice if I sell only exempted products to a single customer? A bill of supply should be issued when a registered dealer supplies exempt goods or services. For example, when a registered taxpayer supplies handloom, they have to issue a Bill of Supply instead of a tax invoice. Whether Petrol is exempt good or non-taxable good? Petrol is non-taxable good since it is excluded from levy of tax for the time being. Is e-way bill required to be generated in case of movement of exempt supplies? Not required to be generated. As per provisions of rule 138 (14) of CGST Rules, E-way bill is not required to be generated when services specified in notification no. 2/2017-Central Tax (Rate) dated 28.06.2017 other than de-oiled cake, is being transported. And, basically, services specified in notification no. 2/2017-Central Tax are exempt services. Not required to be generated. As per provisions of rule 138 (14) of CGST Rules, E-way bill is not required to be generated when services specified in notification no. 2/2017-Central Tax (Rate) dated 28.06.2017 other than de-oiled cake, is being transported. Should I report exempt supplies separately in the GSTR-1 Return? If yes, in which tile / table? Should I report exempt supplies separately in the GSTR-3B Return? If yes, in which tile/section? Yes. Taxpayers should report details of nil rated and exempted outward supplies in the Section “3.1 Tax on outward and reverse charge inward supplies” and the details of exempt, Nil and Non-GST inward supplies in the Section “5. Exempt, nil and Non-GST inward supplies”. What is tax treatment in case when a supply becomes chargeable to tax when earlier was exempt? 1.On Inputs: Can claim credit of tax paid related to such exempt supply on stock held (inputs, semi-finished services or finished services) preceding the day when the supply becomes taxable. 2.On the capital services exclusively used for exempt supply: The credit of capital services shall, however, stand reduced by 5 percentage points for every quarter or part thereof from the date of the issue of the invoice for such services. What is tax treatment in case when a supply becomes exempt from tax when earlier was taxable? Yes. Taxpayers should report co In case of switchover from taxable to exempt transactions, an amount equal to the credit of tax paid on stock held (inputs, semi-finished services or finished services) and capital services (reduced by percentage points) on the day preceding the date of effecting exempt supplies will have to be paid. In other words, input tax credit is fully restricted. However, the taxpayer has the option to pay the same by utilization of available credit. Can a taxpayer claim input tax credit pertaining to capital services used for both taxable and exempt supply? Does exemption from CGST automatically apply as an exemption from SGST? be issued under the SGST Act / UTGST Act. Does exemption from IGST automatically apply as exemption from CGST? For purposes of input tax credit reversal, what are the supplies that are included in exempt supplies?